Final Touch Balloons & Event Decor, serves the entire Portland, Oregon metropolitan area from Vancouver, Washington to Salem, Oregon. We specialize in balloon decorating services including balloon special effects, amazing wedding designs, custom affordable stage backdrops, special occasion balloon deliveries, and spectacular and beautiful event decorations. Whether you are in need of 50 balloons delivered for a birthday party or anniversary, or you need a balloon arch to celebrate the grand opening of your store, or even if your needs include a 20-foot tall detailed teddy bear to celebrate your child's first birthday, Final Touch is here to serve you and make all your dreams a reality. If you haven't seen the rest of our site, you might want to check it out. If you click on our "Home Page" button above, you will see for yourself the incredible sculptures designed and created by our owners, Wynn and Lindy Bell. Wynn and Lindy both were raised right here in Oregon. 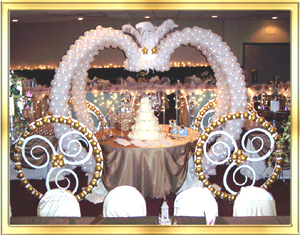 They began their business in 1989 in California and quickly became one of the top balloon companies in the United States when it came to beautiful wedding designs. 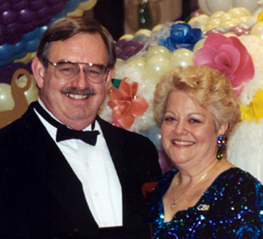 In 1994 Wynn and Lindy became Charter Members of the now 12,000+ businesses who are members of the worldwide Qualatex Balloon Network, and were two of the first balloon artists to earn their Certified Balloon Artist ("CBA") title. Today there are over 2,500 CBA's worldwide. 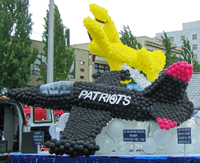 By 1999 Wynn and Lindy had earned top honors within their industry by winning the coveted First Place Award in the Large Balloon Sculpture Competition at the International Balloon Arts Convention, and winning that award over contestants from over 30 countries worldwide. In 1997 they won with their 5,000+ balloon sculpture which they titled "A Touch of Magic" but is known throughout the balloon industry as "The Cinderella Carriage". In 1998, they won again with their sculpture "Heavenly Concerto", also referred to in the industry as simply "The Piano". Their decorating business in California was at its peak when, during their last year there, they decorated over 200 weddings and over 150 corporate events. Although their business was more successful than they'd ever dared hope it would be, Wynn and Lindy found they were not comfortable with the hectic pace of California's Silicon Valley. They truly missed their beautiful Oregon and were thrilled when they had the opportunity several years ago to move back "home". Wynn and Lindy truly appreciate the "gentler" and less hectic pace of the Oregon lifestyle, not to mention the Oregonians themselves. They love working with their corporate clients, brides, event planners and bar and bat mitzvah clients. Following is a list of some of their industry achievements over the past 19 years. 2000 - IBAC - Second Place - Large Sculpture - "Rainbow Bridge"
1995 - Co-Designer IBAC11 Final Night Gala Centerpieces - "Elegant Mardi Gras"
Click Here to return to our "Home Page"